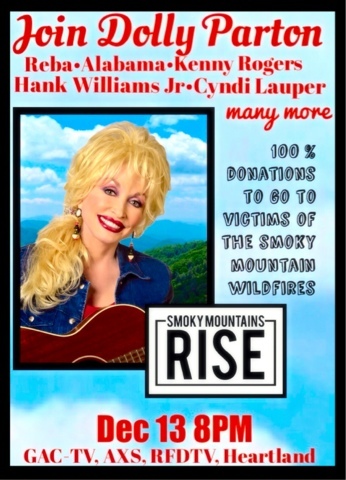 PIGEON FORGE, Tenn. (December 11, 2016) – The impressive lineup of performers continues to grow for Smoky Mountains Rise: A Benefit for the My People Fund on Tuesday, Dec. 13 at 8 p.m. (EST).Hank Williams Jr., Cyndi Lauper, Alabama, Don McLean, Ronnie Dunn, Jamey Johnson and Lauren Alaina have been added to the star-studded telecast, which will be broadcast on GAC, AXS-TV, RFDand The Heartland Network. A number of celebrities will answer phones during the telethon. Paula Deen and her sons Bobby and Jamie, RaeLynn, Dailey & Vincent,Moonshiners’ Mark & Digger, T.G. Sheppard, Jason Crabb, Larry Gatlin, comedian Henry Cho, Tim Rushlow and more will help man the phone lines during the telethon. All of the celebrities are donating their time and performances to help the effort. Smoky Mountains Rise also will be simulcast across multiple radio chains, including iHeart Media's digital and select on-air platforms,Cumulus Media's NASH Nights LIVE, TuneIn's Country Roadschannel, and several other platforms which are set to be announced shortly. All of the artists are donating their performances to help the effort. USAToday.com and USA Today National Networks will live stream the telethon on their affiliate newspaper websites, including all Tennessee newspaper sites Tennessean.com, Knoxnews.com,commercialappeal.com, jacksonsun.com, theleafchronicle.com,dnj.com, and others.